This is a blog post I've wanted to make for YEARS. Yet I do not want to offend anyone, so I keep putting it off, seeking the right words. Well, today I said to myself: "Enough is enough, just dive in and do your best." That's all I can promise you, that I will try. I'm an old foggie who joined in the 70's. Perhaps I am merely use to things being a certain way. Simultaneously, when it comes to transcendental knowledge, those instructions are ageless. Some years back I was so happy to see wonderful Harinama of the younger generation. Though soon noticed the dancing was incredibly different from the type we did. I give much credit for the sincere who go out, and it is not their fault if no one taught them correctly. Simultaneously, I can't minimize Prabhupada's instructions. I take issue with the 'way' women have been dancing on Harinama. I realize some of my godsiblings may think I make too much of this, and hope they will forgive me - it just seems so opposite of what Prabhupada taught us when it comes to the topic of Harinama. It's too sensual, and takes the attention off the Holy Names, placing more onto beautiful women. 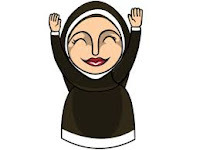 Don't get me wrong, I've no problem with women being beautiful, and disagree with putting bags over their heads or hiding them in the home devoid of Sankirtana participation. Matter of fact, I've even no problem with the attachment these women seem to have to dance in this way IF they stop calling it Harinama and instead call it theater or a parade or similar. That would be bonafide. But when I think of Harinama, I think of Prabhupada, I think of the old days, I think of what it use to be like, and how everyone all over the globe danced the exact same way Lord Chaitanya danced - as Prabhupada taught. When I see the modern devotee ladies doing what looks like the Hawaiian Hula - it says to me that what we were doing in the past is considered boring, not fancy enough, not up with the times, <fill in the blank with some dissatisfaction>. However, such reasons are inaccurate - at best. Yet, do not blame these young women. I've actually read fanatics call them prostitutes, which is offensive and an aparadha! Reading such nonsense is probably why I would stick up for them for quite a while. These are chaste ladies following what their authorities tell them to do. With that said, why no one takes this wrong style of dancing to bigger authorities, or is at least annoyed enough about it as a deviation - is beyond me. It has now become acceptable as Harinama. Personally I believe if Prabhupada were to see it, he'd disapprove, and make corrections. Although their new dancing has its place, that place is elsewhere.... at a RathaYatra, as part of a play/theater, at a Festival, on a stage somewhere, or in the streets as a Parade. Just call it what it is. Names are important. Without them, it's Impersonalism. The purpose of a play/theater is entertainment which we dovetail and make spiritual. Even if ya don't like what these young women do, it can be used for preaching purposes. To clarify, no hips are moving, but there is a wiggling of the arms/wrists/hands 2 or 3 times to each side. Back and forth, side-to-side. But Prabhupada never instructed any wiggling or sideways movements of the hands/wrists. Instead hands are to go above the head - imho that means up toward God/Krishna. Also, it's a motion representing surrender. Additionally, the current, modern ladies, walk to make sure to move their legs/feet in "perfect" unison - more like doing a school dance or part of a parade. Whereas our footsteps were only somewhat united - really just normal walking thru the streets, and sharing the song. Any physical unity was merely natural - no endeavor required. Look at old videos and you will see, the style of dressing as well as the stepping was kept simple - not like the modern version. Even when we picked a place to stop, we didn't really think about how united our foot movements were. We were just sharing the bliss of the Holy Names. I have avoided putting pics of the modern devotee women because I don't want to discourage these new devotees, and I understand they are merely doing what they were told. But it is difficult not to share those, because than you could see the difference. While there is no doubt they are lovely, maybe some out there may not "initially" see a difference, but if we put the pics side by side - women who did Harinama when Prabhupada was in charge - and those doing it now - the difference would be blatantly obvious. Seriously though, if there has to be any choreography, that disqualifies it as Harinama. Then it becomes (spiritual) Entertainment. Harinama and parade are currently being treated as one and the same. They are not. The modern version is a "performance." So why is it that those who participate and do it, rebel against calling it that? There is no harm in putting on a bona-fide show, or holding a parade. Only benefit. Some readers may feel, "So what, they are attracting many, and there's nothing wrong with looking great!" I never said there was anything wrong with looking great [scroll up if you need to reread about that aspect.] Of course we should look presentable, but that's commonsense. It's been taken further. And of course they are attracting many. Any bit of Prabhupada's teaching can attract. Krishna's name means "all attractive." However, it is not as if people were not attracted in the past, but now they are. No. We attracted folks previously with our simple dance, simple clothing, and focus on holy names as what to utilize for attracting. Better to attract through Prabhupada's technique. Why do I care? Because it's not in line with His Divine Grace's instructions about Harinama. As with the books, the saree /dhoti issue, and others I've not time to mention at the moment - little changes here, there, elsewhere - eventually results in making acceptable many unbonafide changes. 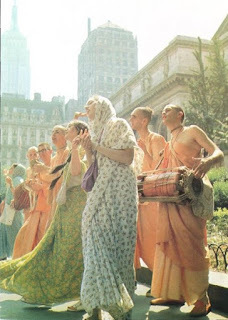 If we are to represent Prabhupada's Movement we must do it his way. Krishna appears in sound vibration, does not require pretty people in material bodies, nor fancy dancing that no one else can participate along with. And if you look at their dancing, it appears no one else is suppose to jump in. It would mess it up. When I was young and went out on Harinama, sometimes a person would join in with us. It was nectar! So much fun. Purifying for all involved. But that is rare these days, as not every one feels comfortable trying to match the new dance, even if they were allowed to jump in. Everyone should feel capable of the dance. Just saw yet another photo of them. A woman up front held her arms out and to the side/middle, in a straight line facing the viewer. The next women, keeping a specific space between them, held her arms slightly higher than the first lady. The 3rd, also carefully spaced apart, held her arms up even higher than the last. And so on. What the heck is this? I never saw that, ever. More theatrics. Which is fine if it's in theater. Four-armed forms on Harinama? 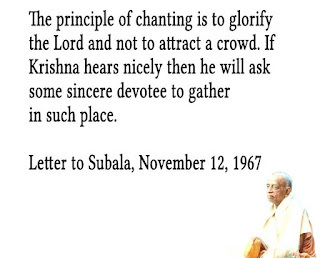 Never instructed by Srila Prabhupada. 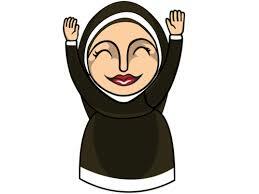 Another new vox populi has been the hand / 2 finger gesture, slid over the eyes, often seen in Hindu movies. I've never once seen Prabhupada do that, nor tell any of his female disciples or theater people to do that on Harinama. This is not Bollywood, not even BharatNatyama [which has it's place, elsewhere]. 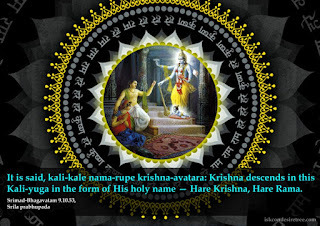 Harinama is the spreading of Krishna's names. Sorry to others who may feel uncomfortable reading this - just had to point out these various, tho related, aspects. In part, felt obliged to because of a post I saw suggestive to the contrary. 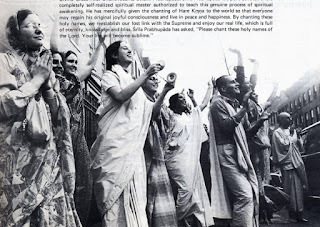 It was from some of these ladies, who commented: It's about energy and what Prabhupada was trying to do........ No. Otherwise he would have had US do it. Energy is impersonal. Sound vibration is personal. 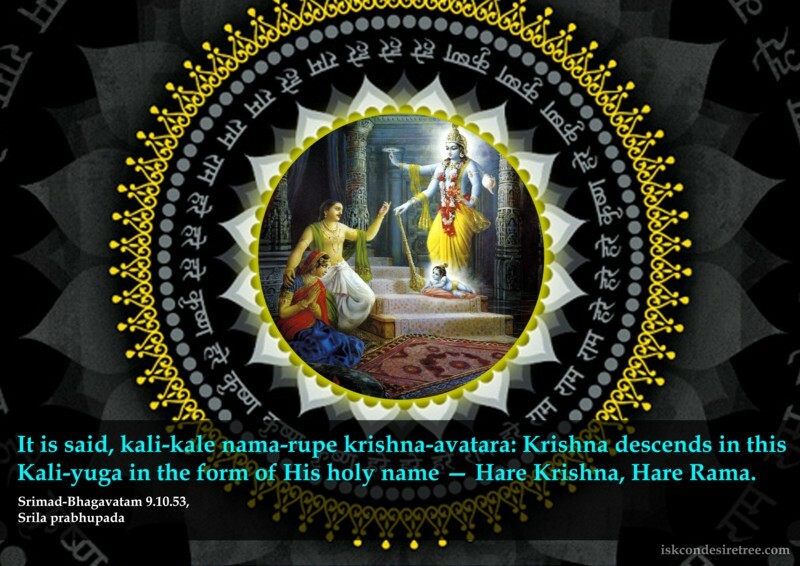 Quotes reveal Krishna dances on the tongue during chanting. 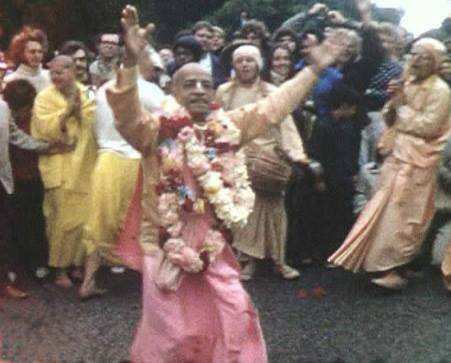 There's no question of what Prabhupada wanted; he's clear in his instructions. Nowhere is this modern dance concoction acceptable as Harinama. Entertainment? Sure, no problem. Call it Street Theater or Etc. 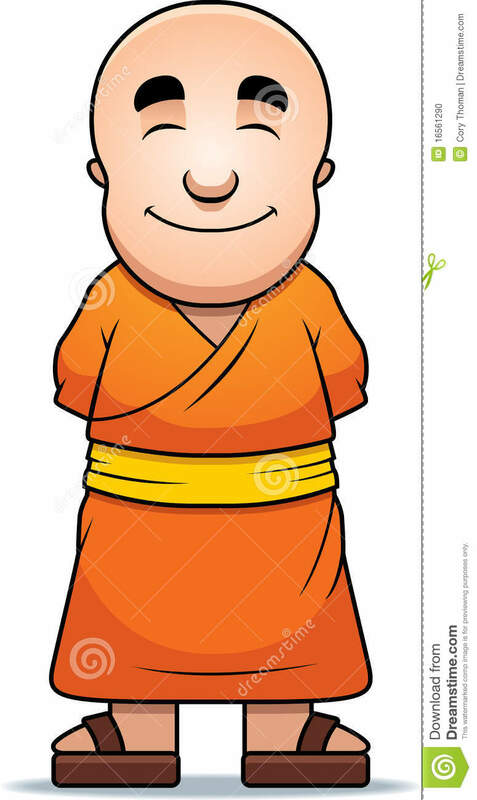 However, when looking at a Buddhist monk or Catholic priest / nun, we expect a certain amount of simplicity in both their appearance and behavior. We already have pretty flags [to glorify God], posters, etc for Harinama - we do not need the beauty of women to promote the unparalleled beauty of God's transcendental sound vibrations. Tho I must add, I have also seen some men doing that Russian Squat dance - or Break-dancing. Therefore, it is not limited to women. Previously while walking throughout the streets, men would be upfront to protect women from any crazies who might be out there, with the women in the middle. Today? Women are walking upfront! Some may point out they can find pictures of the women up front even in the old days. I agree! It was one of those things where, ya had to be there to understand what was going on. And here is the summarized reason: The nondevotees were having a lot of trouble accepting women in the back. [Where they sometimes, wrongly, wound up front.] They viewed refusing women to be in front in a very poor light, so sometimes the women were "brought" up front. You can't see that in the camera. Some of those pics were arranged, tho others were not. Is this the same as what's being done today, pleasing the nondevotee for the sake of preaching? No. Why? Again, it has been taken too far. And predominately, we stuck with - women in the middle. Anyhow, 'initiated' disciples - stop trying to pass off entertainment, fancy dance style, cool or exotic or gorgeous clothing... as Harinama. HariNama means it's all about Hari, and nama = name. 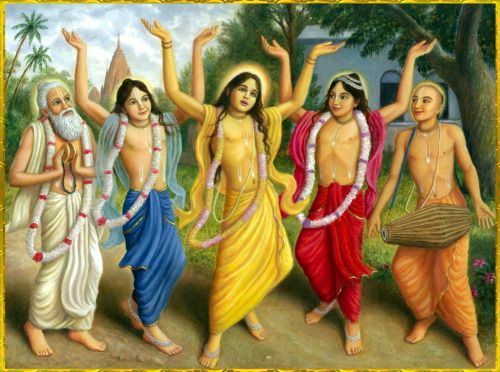 Dancing that is not the same as Lord Chaitanya's, or in accordance with Prabhupada's directions - are out of synch with the way His Divine Grace had us dance to glorify God. No getting showy. Heck, he even spoke against mrdanga players who got showy, as well as with kirtana. I've given credit to these ladies dancing as spiritual in the past. I am not saying it isn't spiritual. It is. However, there are specific instructions for initiated disciples, and seeing a post by one of these ladies saying: "If we don't get their party, then we don't get what Prabhupada is trying to do," that was too much. Show us a quote. It felt like Impersonalism. Harinama is not about mere energy, it's about the SOURCE of energy - God / Krishna. Their comment kind of made me stop sticking up for them. Oh I still will if someone calls them prostitute, but other than that, they first need to understand 'what' they are truthfully meant to be doing, [spreading Krishna's Name], and not about "getting off" on energy. More important, their prerequisite defense suggests they've not paused for a moment to think another way - need no correction - we're the ones with the problem. They stated we're lacking humility, yet they maintain an attitude & do not appear to be taking the Prabhupada quotes we show, very seriously. If I find a Prabhupada quote that proves me wrong, I will surrender to it. :-) .....So far, no such quote. Quite the opposite quotes, really. Now, I was kind of ready to let all this slide, until one day someone posted a video of dancing women, captioned: "Krishna Consciousness is spreading everywhere." To me that sound more like: "Making changes to perfect transcendental knowledge is what's spreading Krishna Consciousness everywhere." So I had to touch on the subject matter. The short answer IMHO is, if we take anything of Prabhupada's and use it, some degree of Krishna Consciousness will come thru. Of course it will benefit others. I am not saying there is no Krishna Consciousness in these dancing's. No. I have often said they are doing it from their heart and in accordance to what they were instructed. But what did Prabhupada instruct? 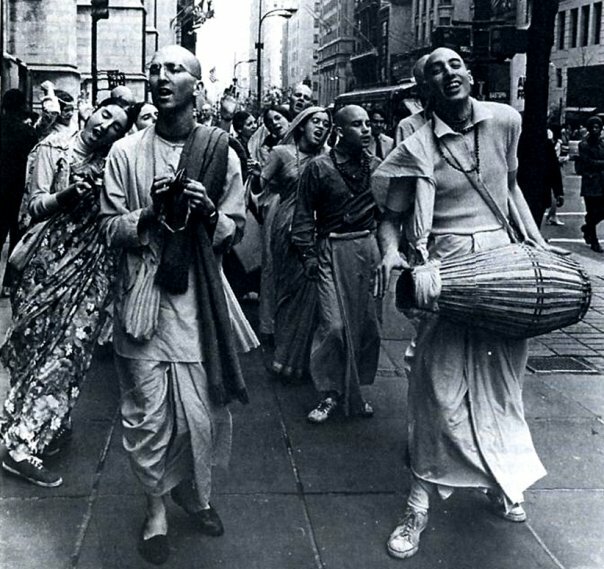 Simply, I believe we should not change the dance Prabhupada gave us (a simple one anyone can jump in and and do with us) - to something entertaining but the average person can not do. False ego makes it hard for any of us to admit when wrong, myself included. [I'm working on it.] But there's a point where transcendental instructions should feel more pressing. The purpose of Harinama is preaching. Not showing how nice we can dance. It's also to inspire others to want to dance and chant "with" us. I've seen that countless times 'when' the dance was kept simple. Additionally, the current Harinama dance would not appear, to the onlooker, like a cross-section of womanhood, since every lady seems to be young and beautiful, very colorfully dressed (which is nice, but....), older women can not join in easily, if at all, what to speak of how some who are less lovely in bodily appearance may not want to stand next to such lovely ladies! How can that be Harinama than? We do not need bells and whistles, just the holy names. Therefore, at this point, I can't keep supporting their dance style, as it turned into being more about them and the fun they're having - less about admitting they need to make a change. Which by the way, there is no loss by making such a change, but an increase in fun. Don't get me wrong - I'm actually very relaxed about what happens on Harinam. Simply, they've crossed a line. Nothing needs to be added to Harinama. Wait, it's not that I disagree with what they are doing, I disagree with what they are calling it. 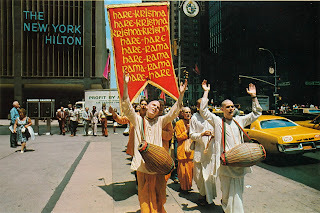 If they merely change the name to something like "Parade" as we do for Ratha Yatra 'parades,' or to "Street Theater" which I remember LoiTaksha and his wife preforming when Srila Prabhupada was on the planet - clearly spiritual entertainment, that's fine. Even, I saw them do a play on a stage for him that included ballet. [I sat a few rows behind Prabhupada and could see the back of his head - yipee!] He made a positive comment about the play. All this is perfectly fine - as spiritual entertainment. Prabhupada actually wanted a lot of theater! But keep the name of Harinama what it is intended for. * Do not let any of this scare you away - quite the opposite! :) It's not hard to do Harinama - it's simple! No dance lessons required. lol Grab a friend and go out. One sings lead, the other follows / chorus. This may be less obvious if there's only 2 of you ha, but so what. It's divine! You will have a blast! * What about instruments? If concerned you don't own or know how to play a mrdanga / drum, or etc - not to worry. No instrument nor particular musical skill is required. Have two hands? Clap them. There ya go. :) ..... OR maybe the reader does own an instrument and knows how to play but wonders if it's acceptable out on Harinama? Yes, if used for that purpose. Prabhupada said any instrument can be used as long as the focus is on the holy names. [Google if you want the quote.] The harmonium is not a Vedic instrument, it's French! 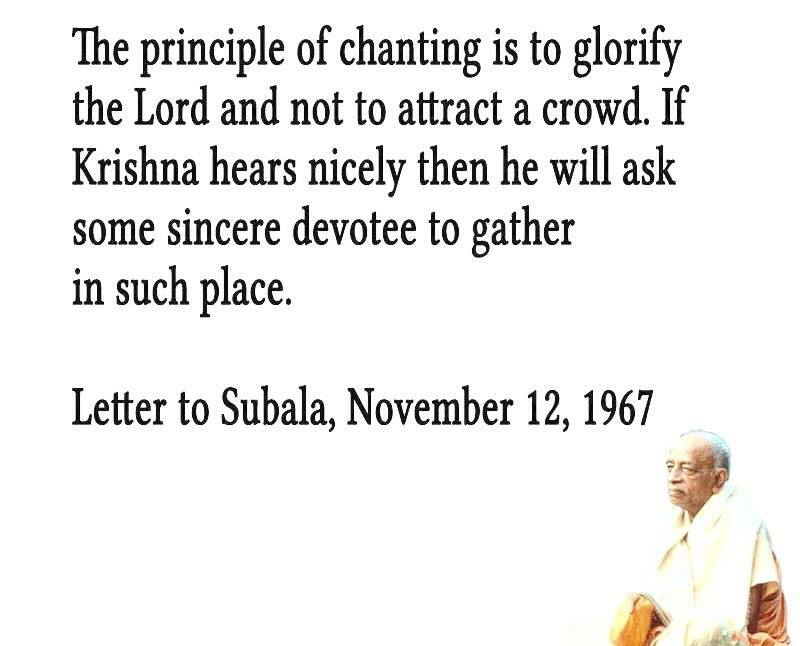 :) Yet Prabhupada was expert at it - to chant about Krishna. Harinama's easy, give it a try. Consider going out into your local town - or not-so-local may be preferred, or college campus, a park, anywhere it's allowed. Experience the bliss for yourself!